Most of us will have read a lot about North Korea in recent weeks. It seems a very unattractive place to go now, and I suspect that the ‘Hermit Kingdom’ seemed equally unattractive to most people in the 1800’s. 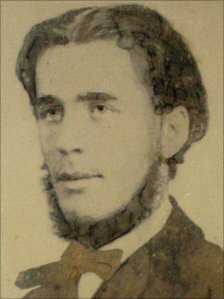 But not to Robert Thomas, a young Welsh missionary. His wife died in China as a result of a miscarriage, but rather than heading back to his native Wales in his grief, Robert was haunted by the needs of Korea. In 1865 he set sail for this spiritually unreached land, staying there for some months, before returning to China. I would have been deterred from the beginning by the fact that I had no written Christian material in the Korean language. Not Robert. He handed out tracts and New Testaments in Chinese. In 1866, Robert learned that an American boat, the General Sherman, was going to try to establish trade relations between Korea and the United States. Here was an opportunity to go back to this needy mission field. So he offered to accompany the boat as an interpreter in exchange for a chance to spread the gospel. The Governor of the province, Pak Kyu Su, attacked the ship, and as the sailors fled from the boat, the Koreans killed them. Robert leaped from the boat carrying a Bible. "Jesus, Jesus!" he cried in Korean to the attackers, offering them the Bible. His head was whacked off with a stroke of a machete according to one account, but others think he pleaded for his life and was beaten to death. Was it all a waste of a young man’s life? However he died, God worked in the heart of the man who killed him. Convinced by Robert's beaming face that he had killed a good man, he kept one of the Bibles, wallpapering his house with it. People came from far and near to read its words. A church grew. A nephew of Robert's killer became a pastor. Today 40% of South Koreans are Christians and the nation has some of the largest congregations in the world. Even in the totalitarian regime in the North Korea, there are believed to be secret Christian believers, but they risk everything for their faith. If they are discovered, they are brutally punished unless they recant. In fact a recent report claims that when fugitive Christians who were hiding in ditches in the countryside were caught, they were run over by a steam roller, feet first.